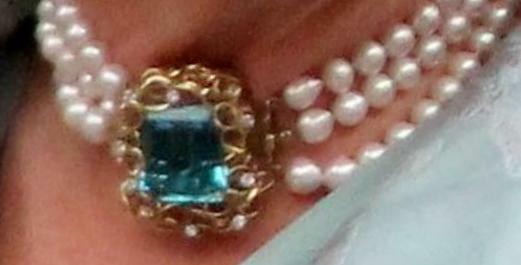 One of most distinctive pearl chokers in The Duchess of Cornwall's collection features three strands of pearls and an aquamarine clasp. The pearls, which look to be natural pearls, are large and slightly irregular. The clasp has a large square aquamarine stone embedded in a nest of twisted gold strings studded with small diamonds. Of all her pearl necklaces - and she has several - this one may have been in Camilla's personal collection the longest. She's been wearing it since at least the 1970s, and continues to do so today. It is a family heirloom that came from her mother, the Hon. Rosalind Shand (née Cubitt), according to an article in Hello! magazine. The Duchess of Cornwall has worn the choker for special events like Trooping the Colour as well as evening events, and the size of the clasp makes it an instantly memorable statement piece.